I am excited about the new Holiday Catalogue!!! I am seriously seriously excited! TOMORROW is the release of the brand spanking new HOLIDAY CATALOGUE. This catalogue will run from the 1st of September through the 3rd of January and let me tell you, it is full to the brim of absolutely amazing products. Stampin' Up have really outdone themselves from gorgeous Designer Paper Series and Suites, Stamp & Punch/Die Bundles, Stamps, Accessories, Ribbons (ohhhhh the ribbons!!!) and so many other cool things including THREE amazing all inclusive kits with MATCHING stamps! I have so much I want to show and let me tell you I am busting at the seams to show you the inside of the catalogue. I so so want to, but alas I will wait till tomorrow. No sneaky sneaky peeks just yet. What is exciting is that I am having a RELEASE PARTY that is going to run for a whole week! I will be having product posts, videos, highlights, competitions and giveaways! You will be able to order and every single order that uses the September discount code will get a FREE GIFT at the end of September (with an added bonus for those that order during the release party!) So many great things that I don't know what to share first. Another thing I wanted to mention is my REFER A FRIEND promotion. 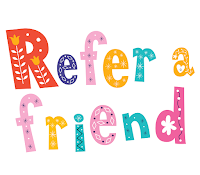 Simply add yourself as GOING on the online party and invite a friend or more and have them comment on the PINNED POST and each guest will entitle YOU to a FREE GIFT! Here's the link to the party. I really hope to see you there! Hope to see you at the party, or next time you visit my little blog!